The 31 DVI mid-sized gas fireplace insert provides a beautiful, efficient and economical way to heat your small to mid-sized home or living space. 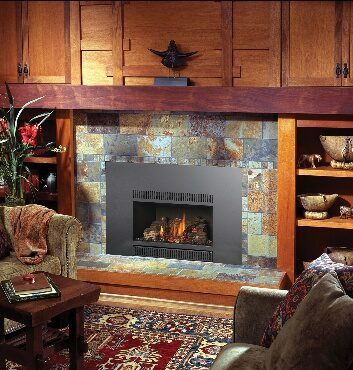 For its size, this gas insert features a large, open fire viewing area that showcases a stunning display of fire that can complement any personal style. The 31 DVI includes powerful convection fans that warm your room quickly and help circulate heat to other areas of your home. Basic heating functions and simple, manual controls make the 31 DVI an easy gas insert to own and operate. With this model, you have the choice of the optional Basic Remote Control, Wall Thermostat or Wall Timer.